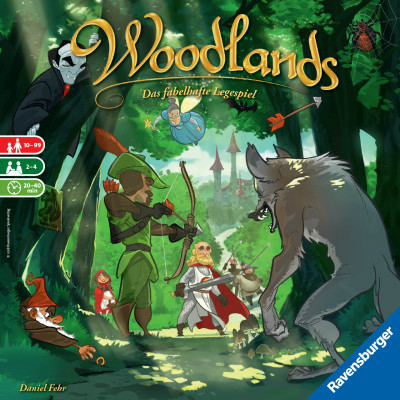 Woodlands transports you to the wonderful world of legends and fairy tales, with four different stories of increasing difficulty. Each story consists of several chapters, with each chapter showing a plastic overlay that features various collectibles, obstacles, and that chapter's goal. Each player then builds their own network of pathways on their personal playing board to beat the chapter and score as many points as possible. Once players are satisfied with what they've built, the overlay is placed on top of each player's pathways to check which goals they've met. Two additional overlays may be used to increase the difficulty of any chapter — and to increase the difficulty further, players may use the back side of their path tiles for a greater challenge.